I have visited your website and I was impressed! Honestly, you did a great job! Thank you. As Webmistress of "My American Heroes", I am proud to present you with my Excellent Patriotic Award. Ned, I can't tell you how proud I am to present you with this award. I will post your site and link to my Winner's Circle. A site like yours should be viewed by the masses. Again, congratulations on a job well done. Congratulations! CasperPlatoon.com has been reviewed and chosen to bear the prestigious 2003-2004 Golden Web Award in recognition for your creativity, integrity and excellence on the Web. The "Honored Veteran Award" is presented by the Vietnam Veterans World Wide to the above mentioned Casper Aviation Platoon Veterans, and other veterans for their service. Please take a moment and read the names and go out of your way to thank a Veteran both past and those now on active duty. God Bless our Veterans. The 173d Airborne Brigade - Casper Aviation Platoon website has been reviewed by the Board Members of The Vietnam Experience and found to be an excellent website that promotes a positive and honorable history of those who served in the Vietnam War. 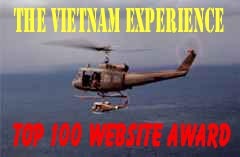 We want to honor your website with our Top 100 Websites Award that you can display on your website. 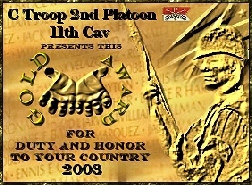 You are awarded this honor March 18, 2003. I would like to take this opportunity to congratulate you on a fantastic website. Thank you for your continued dedication to Vietnam Veterans and the 173d Airborne Brigade. 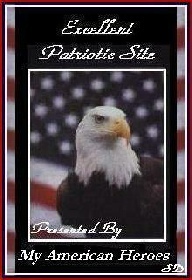 Infantrymen.Net has reviewed your site and found it to be one of the top military sites on the web! To let others know how great we think your site is feel free to display your Site Award anywhere you wish! Fantastic website! Keep up the great work!